As we approach year-end, it's again time to update scorecards to see who's winning the investing game. Last year (2004), Bill Miller, manager of the Legg Mason Value Trust (ticker: LMVTX), extended his winning streak to 14 consecutive years, handily beating the S&P 500 each and every year since 1991. 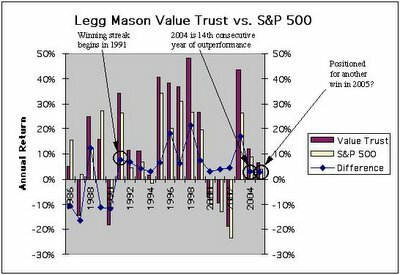 During this 14-year period from 1991 to 2004, Mr. Miller's annual outperformance has ranged from as large as 21% in 1998 (Value Trust's 48% vs. S&P 500's 27%) to as small as 3% in 1994 (1% vs. -2%), 2000 (-7% vs. -10%) and 2004 (12% vs. 9%). With just seven trading days remaining this year, the match-off is again a tight one: Value Trust up 7% year-to-date versus the S&P 500's 4%. Odds are that Mr. Miller will beat the index for the 15th consecutive time, but with weekly market volatility around 2% or 3%, the race is still too close to call. Certainly, Mr. Miller's 14-year winning streak is impressive, especially in the context of professional fund management, an industry in which the average fund manager typically underperforms broad market indices like the S&P 500. Mutual fund screeners (e.g., Yahoo's, which takes data from Morningstar) show about 11,000 stock funds. Noting that 11,000 sits between 2-to-the-13th power (8,182) and 2-to-the-14th power (16,384), we should expect by pure probability alone to find about one fund manager in 11,000 who has a winning streak of 13 or 14 years (similar to performing 11,000 trials of 13 or 14 coin tosses and finding one streak of all heads). From this perspective, Mr. Miller's performance is still exceptional (just as a string of all heads is exceptional), but we should not be surprised to find an exceptional performer among the many thousands of mutual fund managers out there. In other words, while Mr. Miller does appear to have a "golden touch," he is not necessarily a living incarnation of King Midas. What interests me in Mr. Miller's investing style is that in many ways it is similar to my own: long-term thinking, low portfolio turnover, concentrations of few holdings, value-oriented, semi-contrarian, significant weighting of Internet companies. Although I do not track my own performance with the same rigor that mutual funds do, my curiosity after running the numbers to verify Value Trust's performance relative to the S&P 500's led me to look back into my own financial records. I am able to extract meaningful performance numbers only for the past five years, i.e., from the time my predominant focus became investing for my own portfolio. Finding: For five years straight, my own portfolio too has outperformed the S&P 500. Hmm . . . let's see--that's a notable but humble 1-in-32 occurrence compared to Mr. Miller's noteworthy and impressive 1-in-16,384. For anyone interested in reading a good argument for being long equities today, please have a look at Mr. Miller's 3rd quarter commentary. It's now a couple of months old but still relevant in this investing climate where "I think the market is going up."